Home » Investment » Why gold is shining more? 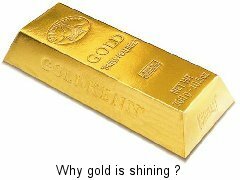 Why gold is shining more? Gold many people consider it as safest investment option. If you closely observe than gold price are rising continuously since past few decades. In this article we will cover top most reasons why gold is shining more compare with other investment options. If we closely look consumption of gold produced in world than about 50% used jewelry, 40% in investments, and 10% in industry. If we compare than India is the world’s largest single consumer of gold, as Indians buy about 25% of the world’s gold mostly for jewelry. If we see supply versus demand than this ratio has much higher difference means globally demand of gold is high and supply is low. If you see list of gold producing country mostly all gold mines are situated outside india hence india has no way other than importing gold for consumption. One has to make payment in dollar during import of gold, If you see history dollar price was 45 Rs/- now it has gone up to 51 Rs/- or more hence due to rise in dollar value one has to pay more money for purchasing same thing. Currently world is on verge of recession as most of country US, Europe, Italy are below debt and unable to pay the same. In many countries Industrial output & GDP estimates are lowering down not only that lot of people are unemployed. Now, you must be thinking that how it is connected with Gold price. Due to fear of recession stock market shows correction and lead to negative returns on investment in equity and mutual funds. As return from equity market is negative most of people try to find out safe investment option which provides high return hence they opt for “GOLD”. As more people buy gold demand increases hence gold continue to shine. The decline in production of some gold-producing countries to be another reason added to the reasons for the high prices of gold, the most important gold-producing countries are: South Africa and the United States, Canada, Australia, China and the Philippines. Mining for gold is becoming very expensive and no new sources/mines are being discovered. Cost involves & technology involved in extracting gold from difficult locations and various environmental costs are very high and deteriorating the situation further. Many country including India & china intends to increase its gold reserve and purchasing gold in bulk this purchase in bulk is causing increase in price as supply is low. Reserve banks of these nations as well as others like South Africa, Russia etc are stocking up on gold in lieu of their cash reserves. Most experts see the rapid rise in gold prices supported by fundamentals and not simply speculation. Looking at current situation it seems that gold price will continue to rise further.